A year ago, the building on the corner of Laurel & New Market st was a run-down shell of a former bar, but since then, it’s undergone a major renovation to be reborn as Jerry’s Bar: the perfect edition to the Northern Liberties neighborhood. With exposed brick walls, a marbled bar top, two floors of bar and dining space, this isn’t your run-of-the-mill, hipster PBR joint. They’ve got a highbrow bar menu, a solid cocktail list of the classics, and a bunch of off the beaten path beers both in bottles & on draft. 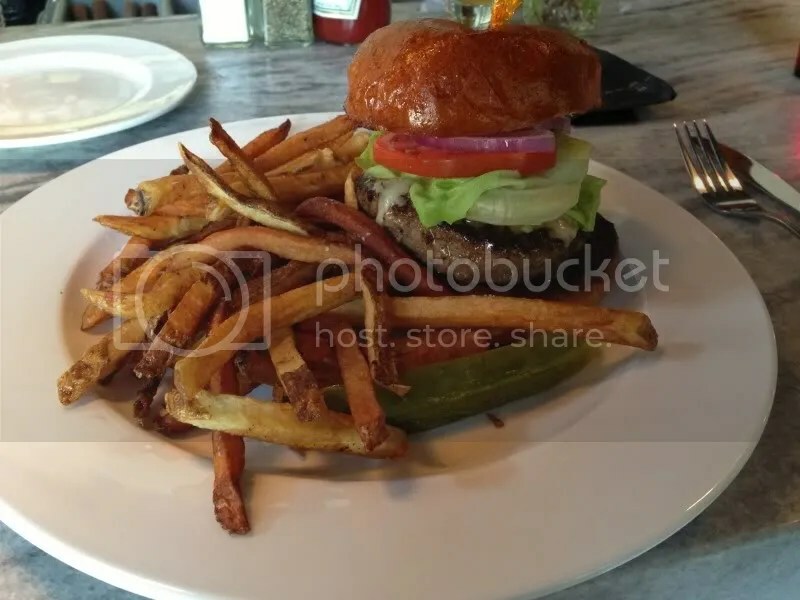 After a series of misses in the burger department, I was worried about trying the deluxe burger: topped with bibb lettuce, tomato, red onion, your choice of cheese (I got cheddar), sandwiched on a brioche bun. My burger came out quickly, and was slightly more on the medium well side than medium, but still nice and juicy. The lettuce was crisp and fresh, as was the tomato. And the bun was soft, slightly buttered and toasted, which gave it a delicious “melt in your mouth” flavor. I could also detect that the meat was seasoned with a little bit of salt and pepper, which is how I tend to make my own burgers at home, so it was nice to enjoy a burger with that home-cooked feeling. There’s also the “Jerry’s Burger”, which has caramelized onions & cheddar, but I wanted something a little bit lighter on a hot, summer day. (I know I was just saying how I wished I could find more burgers with caramelized onions as a topping, so I’ll have to come back to check it out.) Pair it with the Weihenstephaner Hefeweissbier like I did; I promise you won’t be disappointed! Posted in beer, brioche, buns, burger, burgers, Jerry's Bar, neighborhood bar, Northern Liberties. Bookmark the permalink.